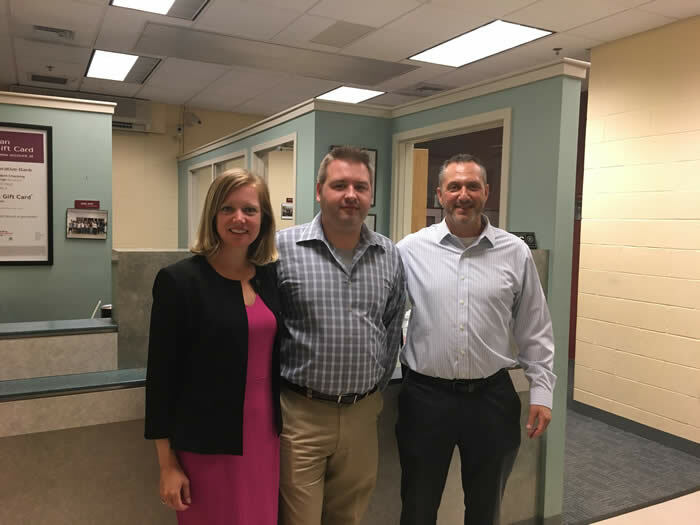 Reading, MA – Reading Cooperative Bank and Reading Public Schools are celebrating a 10-year milestone of providing a full-service educational banking branch at Reading Memorial High School. The partnership not only offers a business course in retail banking, but also gives students an opportunity to open their first checking or savings account. The branch is convenient for RMHS faculty and staff, as well, affording them a way to bank at work. As a lab to support the Business & Technology Department’s curriculum, the RMHS branch provides students with a business elective course, called “Retail Banking,” by staffing student teller positions with sophomores, juniors and seniors. These students assist with the day-to-day operations of the bank, developing quality business interaction skills that translate into future careers. RCB aims to improve students’ financial literacy and set the table for them to become responsible bankers as they graduate into adulthood. Student tellers have even been hired by RCB as part-time tellers for the bank’s other branches. 1. By the end of the 2017-2018 school year, roughly 400 students will have gone through the Retail Banking Course over the decade. Over 20 families in Reading can proudly say they have legacy student tellers. 2. To celebrate RCB’s donation for new lights on the new football field, President & CEO Julie Thurlow threw out the first football following the completion of the high school renovations in 2008. 3. In 2013, RCB won two silver Northeast Marketing awards for Economic Development and Financial Literacy for the work done at RMHS. 4. Over the course of the decade, RCB has hired over 15 students from the program as regular part-time tellers or to work in other departments within the Bank. 5. Student tellers have participated in the Massachusetts School Bank Associations’ annual competition held at the Federal Reserve Bank of Boston. In 2015 and 2017, students won second place for bank products they developed. Over the decade, numerous RCB/RMHS students also won the essay portion of the Fed competition. Foundation in 2013 for the addition of physics labs. 7. During the 2016-17 school year, RCB hosted a Financial Fair for 285 juniors. Talks are underway with RMHS to plan a second fair during the coming school year. 8. First semester student tellers are taken to RCB’s headquarters for a full school day workshop. 9. Through the Reading Scholarship Foundation, RCB has donated over $20,000 over the last decade for student scholarships. 10. In the past, banking students have worked with Senior Management, the Marketing Department, and other areas of the Bank. The school branch is located across from the cafeteria at RMHS, and is open from 9:00 AM – 1:05 PM during the school day.